The Republic of Cuba consists of one large island and several small ones situated on the northern rim of the Caribbean Sea, about 160 kilometers (100 miles) south of Florida. 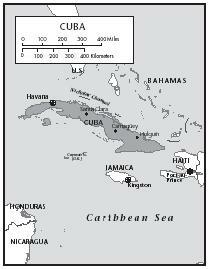 With an area of 110,860 square kilometers (42,803 square miles), Cuba is the largest country in the Caribbean. The area occupied by Cuba is slightly smaller than the state of Pennsylvania. Cuba's coastline is marked by bays, reefs, keys, and islets. Along the southern coast are long stretches of lowlands and swamps. Slightly more than half the island consists of flat or rolling terrain, and the remainder is hilly or mountainous. Eastern Cuba is dominated by the Sierra Maestra mountains, whose highest peak is Pico Real del Turquino. Central Cuba contains the Trinidad (Escambray) Mountains, and the Sierra de los Órganos is located in the west. The largest river is the Cauto. Except in the mountains, the climate of Cuba is semitropical or temperate. Christopher Columbus discovered the island of Cuba on October 28, 1492, claiming it in honor of Spain. As colonies were established, the Spanish began mistreating and exploiting the native inhabitants of the island until they were nearly extinct. The colonists resorted to importing black slaves from Africa to operate mines and plantations. As a result, both Spanish and African cultures formed the foundation of Cuban cuisine. Spanish colonists brought with them citrus fruits, such as oranges and lemons, as well as rice and vegetables. They also grew sugar cane, a major Cuban crop. 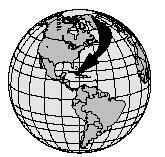 African slaves were unable to bring any items along with them on their journey to Cuba. They were, however, able to introduce their African culture. The slaves developed a taste for fruits and vegetables such as maize (corn), okra, and cassava. In time, Spanish and African cultures joined together to create several popular dishes, including arroz congri (rice and beans, often known as Moors and Christians) and tostones (pieces of lightly fried fruit, similar to the banana). Cuban cuisine, however, drastically changed after the Cuban Revolution in 1959. Fidel Castro overthrew the government. Cubans who opposed him began to flee the island, including chefs and restaurant owners. 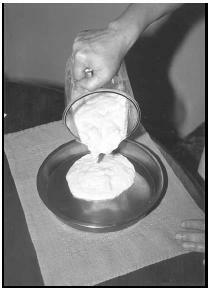 As a result, food shortages became frequent, and food that was still available was of poor quality. As of 2001, Castro was still in power and because of political disagreements with other countries, trade restrictions imposed on Cuba remain, so living conditions and shortages of food have improved little. A favorite dish all year 'round is Moors and Christians made from black beans and rice. 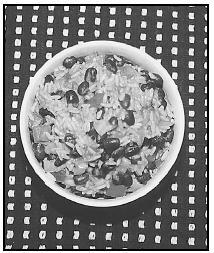 The name refers to the African (black beans) and Spanish Christian (white rice) roots of Cuban culture and cooking. If you are using canned beans, drain the water from them and set them aside. If you are using dry beans, cover them with water. Bring to a boil, remove from heat, and let stand 1 hour. Drain the beans. Use a large, covered cooking pot and sauté the onion, garlic, and green pepper in the olive oil until tender. Add the tomato paste, black beans, cumin, and chicken broth. Add rice, cover and cook over low heat, stirring occasionally until rice if fully cooked (about 30 minutes). Note: Ripe plantains have peels that are almost completely black. However, the firm, ripe ones called for in this recipe are black and yellow. With a small, sharp knife, cut ends from each plantain. Slice through the peel and remove it. Cut the fruit into very thin slices, about ⅛-inch thick. 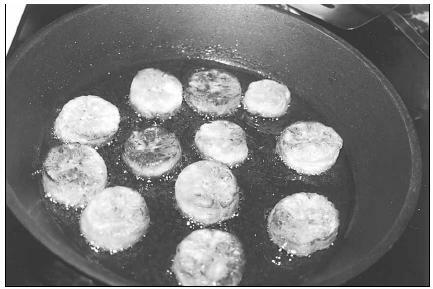 In a large, deep skillet, heat oil (about ¼-inch deep) and fry 12 to 15 plantain slices at a time for 2 to 3 minutes, or until golden, turning them over once. Use a slotted spoon or spatula to remove cooked slices and place them on paper towels to drain. Season the slices with salt. Plantain slices should be slightly crisp on outside but soft on inside. The slices are best served immediately; however, they may be made 1 day ahead, cooled completely, and kept in an airtight container. Reheat plantain slices on a rack in a shallow baking pan in a preheated 350°F oven for 5 minutes, or until heated through. Although Spain and Africa contributed most to Cuban cuisine, the French, Arabic, Chinese, and Portuguese cultures were also influential. Traditional Cuban dishes generally lack seasonings and sauces. Black beans, stews, and meats are the most popular foods. Root vegetables are most often flavored with mojo , a combination of olive oil, lemon juice, onions, garlic, and cumin. Fried plantains, like white rice and black beans, are part of almost every dinner menu. In Cuba, the plantains would be fried in oil about one inch deep. typically eaten. Beef and seafood are rarely prepared, with the exception of lobster (which is so popular that it is becoming endangered in Cuba). Rabbit ( conejo ), when available, is also eaten. Other common dishes in Cuba are ajiaco (a typical meat, garlic, and vegetable stew), fufú (boiled green bananas mashed into a paste) which is often eaten alongside meat, empanadas de carne (meat-filled pies or pancakes) , and piccadillo (a snack of spiced beef, onion, and tomato). Ham and cheese is a common stuffing for fish and steaks, or is eaten alone. The best place to find the freshest fruits and vegetables on the island is at a farmers market. Popular desserts include helado (ice cream), flan (a baked custard), chu (bite-sized puff pastries filled with meringue), churrizo (deep-fried doughnut rings), and galletas (sweet biscuits). Constant food shortages make finding or ordering certain foods nearly impossible. Economic hardship is another reason for poor food conditions. Cuba often trades its fresh produce, such as cassava, for money from other countries. This leaves a shortage of cassava and other produce in Cuba itself. Mix all ingredients in a saucepan and cook over medium heat, stirring constantly for about 10 minutes. Cover, lower heat and simmer for 20 minutes. Scrape the peel from the yucca, and cut the yucca into pieces. Boil yucca in salted water until tender (about 25 minutes). Drain yucca and add garlic and lemon juice. Heat olive oil in a pan until bubbling, then pour over yucca. Mix well and serve. Measure sugar, butter, and water into a saucepan and cook over medium heat, stirring until bubbly and caramel brown. Be careful not to burn the mixture. Pour into a warm baking dish, reserving a small amount to drizzle on top of finished flan. Roll dish to coat the sides completely with the caramel. Mix all flan ingredients and pour into a 2-quart baking dish that has been lined with a caramel coating (procedure above). Place pan in a larger pan that contains water. Bake 55 to 65 minutes, or until pudding is soft set. Chill. Drizzle caramel on top when serving. In a saucepan, make syrup by combining the water, ½ cup of sugar, and dash of salt. Cook for 5 minutes on medium heat. Remove from heat and allow to cool. In blender, combine mangoes and cream and blend until smooth and creamy. (If you do not own a blender, you can mash the mangoes with a fork and stir in the cream). Stir in cooled syrup and lemon juice. Pour the mixture into one 6-cup or two 3-cup shallow pans and freeze until mixture is partially frozen (slushy). Separate egg whites from eggs one at a time. Discard the yolks, or reserve for use in another recipe. Beat egg whites to soft foamy peaks and gradually add the remaining ¼ cup sugar. Place frozen mixture into a chilled mixer bowl, breaking partially frozen mixture into chunks. Beat until smooth. Carefully mix in the beaten egg whites. Return mixture to freezing container and freeze until firm. Pour the mango mixture from the blender into a pan. After the mixture becomes partially frozen, whipped egg whites will be added, giving the sherbet a lighter texture. Cuba is officially an atheist country (denies the existence of God or a higher being). However, it is estimated that about half of all Cubans are believers of a particular faith. There are three general faiths that religious Cubans tend to follow: Afro-Cuban religions (saint worship), Judaism, and Christianity. For Christians, celebrating Christmas during the second half of the 1900s was often difficult. For years the government, ruled by Fidel Castro, did not encourage the celebration of a Christian holiday. However, the holiday of Christmas has been making a comeback since the end of the 1990s. Those who celebrate Christmas prepare a large meal on Christmas Eve. A typical Christmas menu in Cuba might include aceitunas alinadas (marinated olives), ham spread, or ham croquettes (a ham-filled fried cake) for appetizers. Cuban salad, black beans, mashed plantains ( fufu ), Cuban bread, Spanish potatoes, white rice, yucca with garlic, and roasted pig may be a typical dinner. For dessert, rice pudding, mango bars, coconut flan, rum cake, Three Milks Cake, or Cuban Christmas cookies may be served. To accompany their meal, Cubans might drink Cuban eggnog, Spanish sparkling hard apple cider, or a Cuban rum and mint drink. Some Cuban public holidays are January 1 (triumph of the Revolution in 1959); April 4 (Children's Day); May 1 (Labor Day); and December 25 (Christmas Day). During these days, grocery stores are usually closed and people often head for the island's warm beaches to celebrate, often packing food for the trip. On New Year's Eve, a small feast is prepared. At the stroke of midnight, twelve grapes are often eaten (in memory of each month) and cider is served. Mix all the ingredients together in a glass bowl. Cover and refrigerate for a minimum of two days. Break up the lettuce by hand. Toss all the ingredients together with the radishes. Place all the vegetables in the refrigerator to chill. In a separate bowl, mash the garlic with the salt and pepper. Add the olive oil, vinegar, and lemon juice to the crushed garlic. Whisk together thoroughly. Just before serving, gradually add the dressing, a little at a time, while you toss the salad with a large salad fork. Add just enough dressing to cover the salad. Add more dressing, to taste. Boil the rice with water, lemon rind, and cinnamon stick in a pot until soft, stirring occasionally. Add milk, salt, vanilla, and sugar. Cook over medium heat, stirring occasionally until thick (about 1 hour). Before you begin, have a large bowl ready to fill with ice at the end of the cooking time. Combine the water and sugar and boil until it becomes syrupy. Add a little of the hot milk to the egg yolks to warm them. Then very gradually add the egg yolks to the hot milk mixture. Heat for about 5 minutes, stirring constantly with a wire whisk. While the mixture is cooling, add the syrup and mix well. Strain the mixture through a coffee filter or a sieve lined with cheesecloth. A typical Cuban breakfast, normally served between 7 and 10 A.M. , may include a tostada (grilled Cuban bread) and café con leche (espresso coffee with warm milk). The tostada is often broken into pieces and dipped into the coffee. Lunch often consists of empanadas (Cuban sandwiches containing chicken or another meat, topped with pickles and mustard). Pan con bistec , a thin slice of steak on Cuban bread with lettuce, tomatoes, and fried potato sticks, is also popular. Finger foods are popular snacks eaten throughout the day. Pastelitos , small, flaky turnovers (in various shapes) filled with meat, cheese, or fruit (such as guava), are also common snacks. Because Cubans are meat eaters, meat, chicken, or fish will normally be the main dish at dinner. It is almost always served with white rice, black beans, and fried plantains. A small salad of sliced tomatoes and lettuce may also be served. Fast food establishments exist in Cuba, though popular U.S. chains, such as McDonald's or Burger King, have not yet set up restaurants on the island. However, a chain similar to KFC, called El Rápido, opened in 1995. Burgui , a chain similar to McDonald's, has restaurants throughout major Cuban cities and is open twenty-four hours. Cuban restaurants are almost entirely government-owned. They have a reputation for providing slow service and bland meals. Privately owned restaurants, called paladares , normally serve a better meal, but are under strict government guidelines. Paladares are not allowed to sell shrimp or lobster, and are only allowed to serve up to twelve people at one table. However, most paladares serve these dishes anyway. Government-owned restaurants often try to disguise themselves as being privately owned to attract more customers. In Cuban restaurants it is common to have several menu items unavailable due to shortages of food. Some of the highest quality of food on the island is often found at expensive hotels that mostly serve tourists. About 19 percent of the population of Cuba is classified as undernourished by the World Bank. This means they do not receive adequate nutrition in their diet. About 9 percent of babies born in 1993 were considered to have low birth weight, a possible sign of inadequate prenatal (pregnancy) care. After the 1959 Cuban revolution and a decreased level of support from outside countries, some areas of social and health services began to fall behind. Despite almost one-fifth of the population being undernourished, and a continuously unsettled economy, Cubans are in relatively good health. In 1993, nearly 100 percent of the population had access to free health care, and safe water was available to nearly all (95 percent) in 1995. Almost all doctors work for rural medical services after graduation, allowing rural Cubans to have nearly equal health care services as those who live in Cuba's larger cities. Having access to doctors and various health care services may help to reduce the cases of malnourishment in children. Allan Amsel Publishing. Traveler's Cuba Companion . Saybrook, CT: The Globe Pequot Press, 1999. Baker, Christopher P. Moon Handbooks: Cuba . Emeryville, CA: Avalon Travel Publishing, 2000. Fallon, Stephen. Guide to Cuba, 2 nd ed. England: Bradt Publications, 1997. Lonely Planet: Cuba , 2 nd ed. Victoria, Australia: Lonely Planet Publications Pty Ltd., 2000. Cuba Cultural Travel. [Online] Available http://www.cubaculturaltravel.com/religion.html (accessed February 22, 2001). Cuban Food Recipes. [Online] Available http://icuban.com/food/ (accessed February 21, 2001). CUBAVIP.COM. [Online] Available http://www.cubanculture.com/english/cocina.htm/ (accessed February 21, 2001). Facts About Cuba: Cuba's History. [Online] Available http://icuban.com/facts/history.html/ (accessed February 21, 2001). Three Guys from Miami: The Traditional Cuban Christmas. [Online] Available http://icuban.com/3guys/xmas.html/ (accessed February 21, 2001). There are so many Cuban people, as well as children suffering from lack of nutrition. almost twenty percent of the Cuban population. I find that sad, as well as interesting.